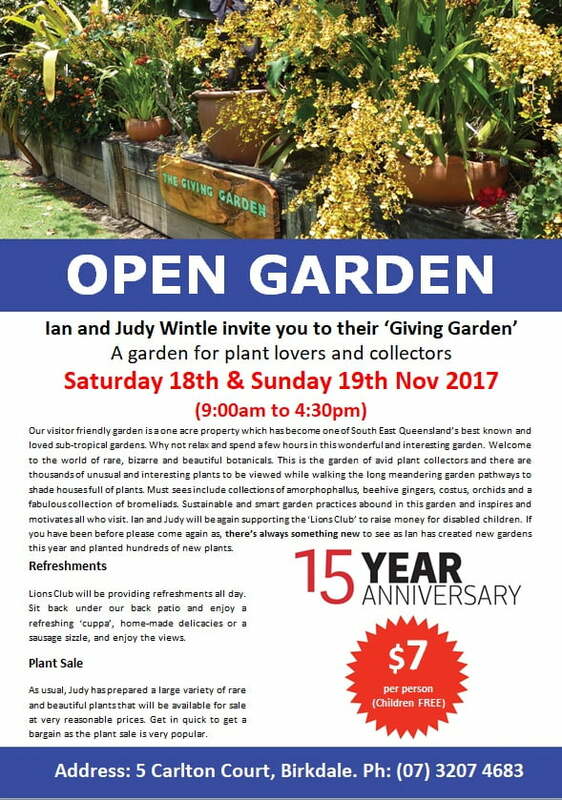 Ian and Judy Wintle have been opening their famous ‘Giving Garden‘ in Brisbane each year for 15 years, raising $60,000 for charity. But 18 and 19 November 2017 will be your very last chance to see it, or visit again. Ian and Judy began their garden in the 1990s, as a way of healing and rehabilitating the whole family after a motorbike accident left their eldest son unable to walk again. Since those terrible early years, the garden has grown into a subtropical paradise of fruit trees, ornamental foliage, water features and flowers, all created on a tight budget by the energetic Wintles, with a wheelbarrow and shovel and lots of ingenuity. As their plant passions have changed, so have the plants, most recently expanding into Amorphophallus, with over 70 different varieties of this extraordinary flowering (and often evil-smelling) plant. 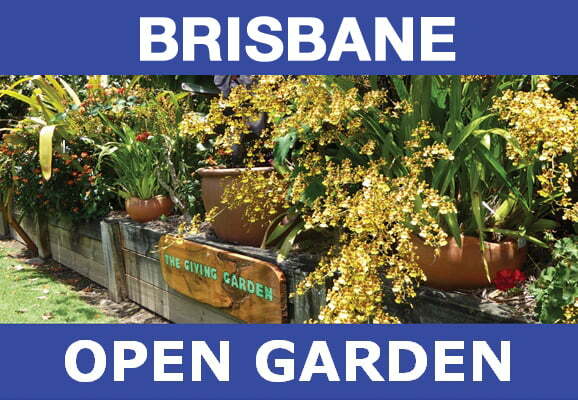 Many subtropical favourites, especially Judy’s extensive bromeliad collection are on show. There is always something new to see in this garden and 2017 was no exception with new gardens established and hundreds of new plants in this lush, tropical oasis. There will be some fantastic and rare plants for sale, refreshments from the Lions Club and also a raffle. Please go along and enjoy a couple of hours in the ‘Giving Garden‘. It will be your last chance as Ian and Judy will NOT be opening again. Hi Noel – If you mean Leschenaultia macrantha the WA red wreath wildflower , I’m sure that it would neither grow nor be sold in Queensland. It only grows in the hot and very dry red sand country that’s east to south-east of Geraldton WA and flowers in response to winter-spring rain. It’s very difficult to grow from seed so it needs to be propagated from fresh cuttings.